Autumnal vibes are finally pervading the atmosphere. No doubt, even the stubborn California sun can’t help but display some kind of change throughout the course of the day. You see, cool, dew-laden morning air has always been my favorite kind of thing to wake up to. Thoughts of chilly morning walks to school nestle into the deepest parts of my memory reservoir. Carefree, blissful, and sometimes-bittersweet recollections resurface as I think of walking to school with my dad. Holding his hand, forever scented with the sweet, iconic fragrance of the Men’s Polo eau de toilette—and things haven’t changed much today—provided a sense of reassurance that swelled from within. Though I feared him in quite a few ways because of his militaristic composure so much of the time, I strangely felt safe walking with him when it was cold out. Crunching the fallen leaves that were subject to the efforts of autumn, I often felt as if I could put down all my guards with him when we did just that. Laughing, amusing ourselves by blowing vapor into the crisp atmosphere, just being there in that moment’s time. I believe this is reason enough for me to be absolutely infatuated with fall. Not only does it provide a sense of familiarity, but it refreshes physiological aspects for me personally as I incubate this little girl growing in the womb. Not being the moping around sort, I like to take advantage of these pregnancy discomforts by taking my nightly brisk walks around the church property where we live. And fall seems to help with that. This season also brings about a sense of community. 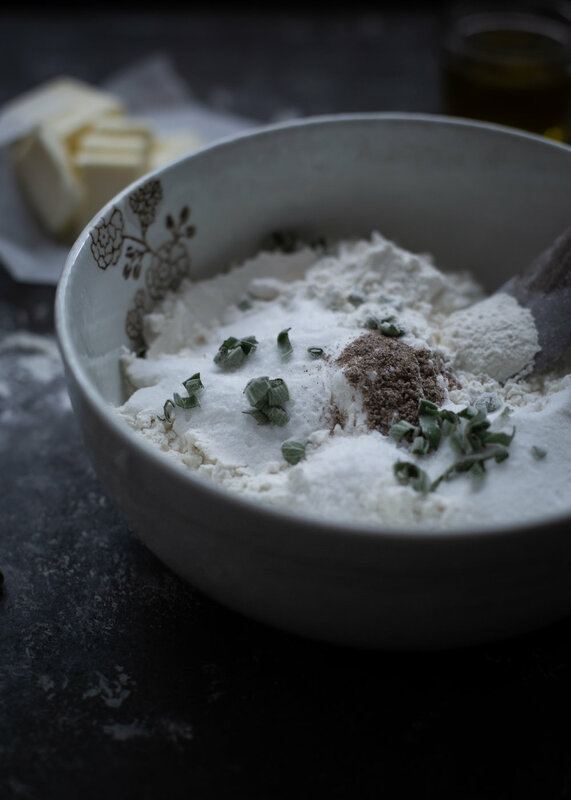 It’s a stretch in time when so many reflect about the beauty and transience of life, leading us to bake and spend afternoons in the kitchen throwing around fresh ingredients. The farmer’s market is teeming with the abundance of fall’s produce. The pears, the figs, the plump tomatoes, the squash blossoms, all beg to appear in warm, comforting dishes. With that in mind, today I’m baking with one of my favorite herbs—sage. It’s quite unconventional to include sage in a sweet dessert, but when it mingles with natural fats like butter and olive oil, it forges an existence all its own. 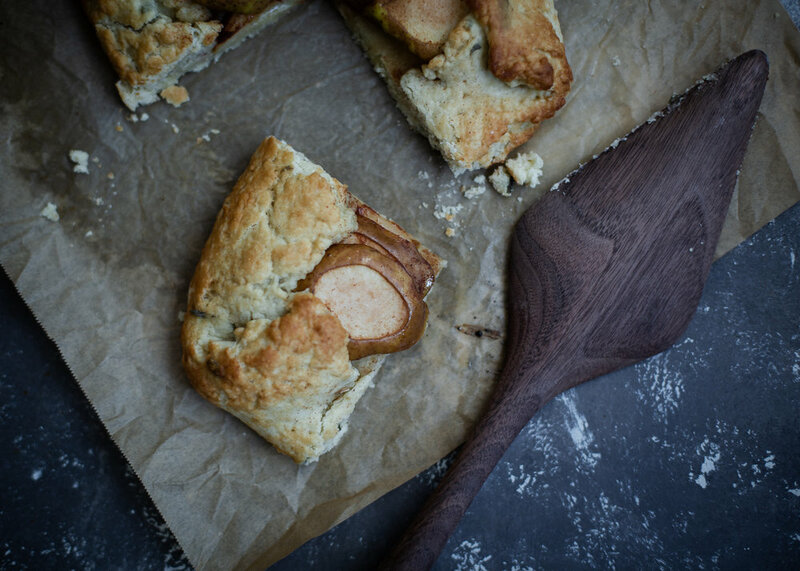 Pair that up with sweet, juicy pears from the farmer’s market (or wherever you shop), and you will end up with a beautiful pie that takes little to no effort. That’s right, folks. The galette is perhaps the best kind of excuse for eating pie on a whim, because as “rustic” as it may look, no one will notice the imperfections. Imperfections are welcome and desired in this case. Here I’m using my basic go-to crust that I haven’t had the opportunity to share as of yet. I’m so happy to finally be able to sit down and give you all a chance to give it a taste. Olive oil, when paired with good ol’ conventional butter, creates a tender and flaky crumb that boasts umami all around. Preheat the oven to 425 F degrees. Put all the dough ingredients into a large mixing bowl in the listed order and, with a large fork or a spurtle like the beautiful one I’m using from Polder’s Old World Market, mix thoroughly until it forms a uniform ball. You may need to use your hands but that’s okay. Just make sure not to over knead the dough. On a flat surface, place a large sheet of parchment paper. You will want to use the paper to roll out the dough into a large rectangle thin enough to be able to bend and fold on the edges without it breaking. Move on to the filling. Slice the pears into thin slices. Place them as you desire on the the dough, leaving about 2 inches of free space all around the edges of the dough. Sprinkle the pears with brown sugar, confectioner sugar, cinnamon. In a small pinch bowl, mix the juice with vanilla extract. Pour it on the pears. Grab the edges of the dough and carefully fold them onto the pears so as to make it seem as though you’re folding an envelope. Sprinkle with coarse sugar all around the edges and on top of the filling. Keep the galette on the parchment paper and simply transfer it onto a large baking sheet. Cover the top slightly with foil and bake for approximately 22 minutes. Then uncover the foil and bake for another 8-10 minutes, or until the crust is flaky and golden. Serve on its own or top with vanilla ice cream. *The gorgeous wooden utensils you see here—the spurtle and the pie cutter—are courtesy of the fantastic Polder’s Old World Market online shop! Their #dreamware is a line of rustic, hand carved pieces that will not only beautify your cooking experience, but they will prove to be functional and useful. All thanks to POWM for making this blog post that much more exciting!